The police, the Catholic Church and the state conspired to cover up a priest's suspected role in one of the worst atrocities of the Northern Ireland Troubles, an investigation has found. 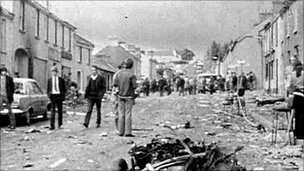 Nine people died in bombings in Claudy, County Londonderry on 31 July 1972. The NI Police Ombudsman's probe found that high-level talks led to Fr James Chesney, a suspect in the attack, being moved to the Irish Republic. No action was ever taken against Fr Chesney, who died in 1980. Northern Ireland Secretary Owen Paterson said that the government was "profoundly sorry" that Fr Chesney had not been properly investigated. Mark Eakin, whose younger sister Kathryn was killed in the blast, said he would like to see someone brought before the courts. Mr Eakin said: "I would like to ask the British government if they would now step in and investigate this thing further, give the PSNI of today, who are still trying to investigate, more resources." In 2002, the Police Ombudsman's office began a probe into the original investigation. 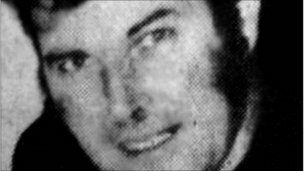 Al Hutchinson's report, published on Tuesday, found that detectives in 1972 had concluded that Fr Chesney was an IRA leader and had been involved in the bombing. He added that by acquiescing to a deal between the government and the Catholic Church to move Fr Chesney to a parish in the Irish Republic, the Royal Ulster Constabulary was guilty of a "collusive act". Did priest get away with murder? He said that if officers involved were still alive, "their actions would have demanded explanation, which would have been the subject of further investigation". As well as investigating complaints made against the Police Service of Northern Ireland, the Police Ombudsman also has the authority to look at investigations carried out by their predecessors, the RUC. Mr Hutchinson said some detectives' attempts to pursue Fr Chesney were frustrated ahead of a meeting between Northern Ireland Secretary William Whitelaw and the leader of Ireland's Catholics, Cardinal Conway. There, it was agreed that the priest would be moved to a parish in Donegal, just over the border in the Irish Republic. The Ombudsman found that the Chief Constable, Sir Graham Shillington, was made aware of this decision. Mr Shillington said he would "prefer a move to Tipperary". Tipperary is about 200 miles from the border. Fr Chesney, who denied involvement in terrorist activities to his superiors, was never arrested. On Tuesday the head of the Catholic Church in Ireland, Cardinal Sean Brady, said the church was not involved in a cover-up over the role of Fr Chesney. "The Church was approached by the secretary of state at the instigation of senior members of the RUC," he said. Sinn Fein, the political party closely indentified with the IRA, said the deaths in Claudy were "wrong and should not have happened." The party repeated its call for an independent international truth commission. BBC Ireland correspondent Mark Simpson said that the report lacks any explanation from Cardinal Conway or Mr Whitelaw about how they came to their decision to move Chesney. "As both are now dead, we can only speculate as to their motives," our correspondent added. "The most generous theory is that they felt that protecting the priest was the lesser of two evils. "During that turbulent period in 1972, many believed that Northern Ireland was on the brink of a sectarian civil war. Almost 500 people were killed that year. "If a priest had been arrested in connection with the Claudy bomb, it could have pushed community relations over the edge." Both Protestants and Catholics were killed in the blasts. The youngest victim was eight-year-old Kathryn Eakin who was cleaning the windows of her family's grocery store when the first bomb exploded. The other people killed were Joseph McCluskey 39, David Miller aged 60, James McClelland 65, William Temple 16, Elizabeth McElhinney 59, Rose McLaughlin aged 51, Patrick Connolly, 15, and 38-year-old Arthur Hone. Mr Hutchinson said that he accepted some of the decisions taken "must be considered in the context of the time" but added that the conspiracy still amounted to collusion. "I accept that 1972 was one of the worst years of the Troubles and that the arrest of a priest might well have aggravated the security situation. "Equally I consider that the police failure to investigate someone they suspected of involvement in acts of terrorism could, in itself, have had serious consequences." He said he had found no evidence of criminal intent by anyone in the government or the Catholic Church. Meanwhile in a statement, the PSNI said the investigation into the Claudy bomb was now under the remit of the Historical Enquiries Team. Who was Father James Chesney? As always. Police is covering up for a criminal - does it surprise you? I am getting tired of how unsurprised I am for our corrupted world. A priest who got away with murder?